Style Tip: Take brights into Fall by pairing them with black and tan color patterns to mute the overall vibe, while also letting the bright be the stand-out piece. Confession: This outfit was chosen solely on the basis that I didn't have to button anything. You know those days where your stomach just cannot bear to have anything constraining around it? I was definitely having one of those days and combined with the fact that I was off to eat Mexican food....well, an elastic skirt was clearly the only option. did you color your hair? the color looks amazing and I LOVE the dark lip with your platinum hair. absolutely beautiful. Hey girl! No, just the same color I've been!! Thanks for the sweet comment! xo! Thanks Carly! Me too!!! It's super comfy! 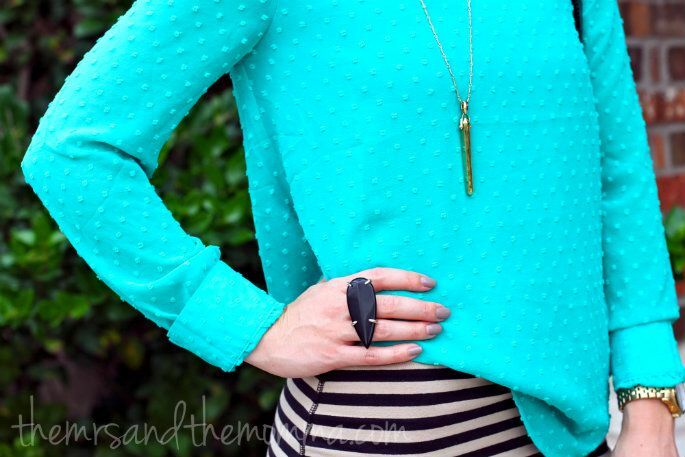 love the turquoise with the black and white! the proportions are great too with the slim skirt and the fuller top! Thank you Lindsey!!! So nice of a compliment! I'm seeing so much black everywhere this really catches my eye. You look great and I love your shoes. Plus I agree with others your hair color is looking beautiful! I love that you tucked in the shirt on the side, as well! 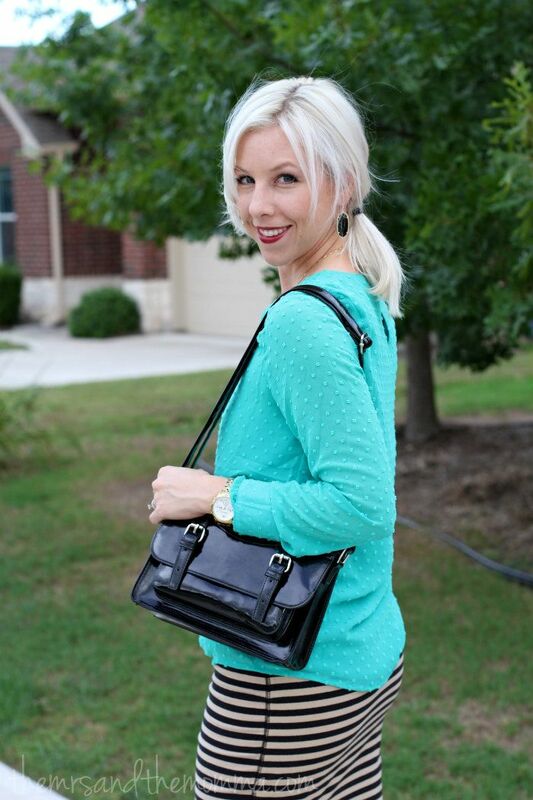 Pairing a bright color top with a muted bottom is such a "do" for fall and winter and you did it so well. Fabulous look! I love the stripes paired with that bright blouse! This look is perfection! Love the skirt! Never thought of pairing neutrals with anything other than neon yellow/green... But I love the bright turquoise with it!